Bittu Kuruvilla, M.D., is a Board Certified Physiatrist (Physical Medicine and Rehabilitation) who specializes in Sports Medicine. She attended college at the University of North Carolina, Chapel Hill, where she graduated with Honors and Distinction with a Bachelor’s of Science degree (B.S.) in Chemistry. She received her medical degree (M.D.) from Eastern Virginia Medical School. After finishing her internship in Internal Medicine and residency in Physical Medicine and Rehabilitation at Eastern Virginia Medical School, she went on to complete a Sports Medicine Fellowship at Montefiore Medical Center, The University Hospital for Albert Einstein College of Medicine. Dr. Kuruvilla’s particular areas of expertise include diagnosis and management of non-surgical sports-related injuries, management of musculoskeletal injuries and pain, including arthritis and overuse injuries, diagnostic ultrasound evaluation for musculoskeletal injuries or pain and ultrasound guided injections and procedures. 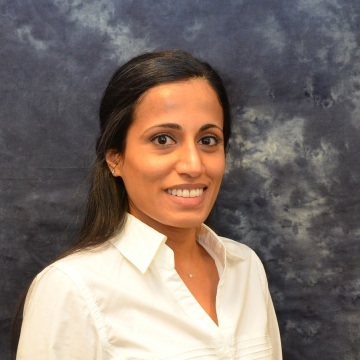 Dr. Kuruvilla is a member of the American Medical Association, American Academy of Physical Medicine and Rehabilitation, Association of Academic Physiatrists, American Medical Society for Sports Medicine and American College of Sports Medicine.